2. 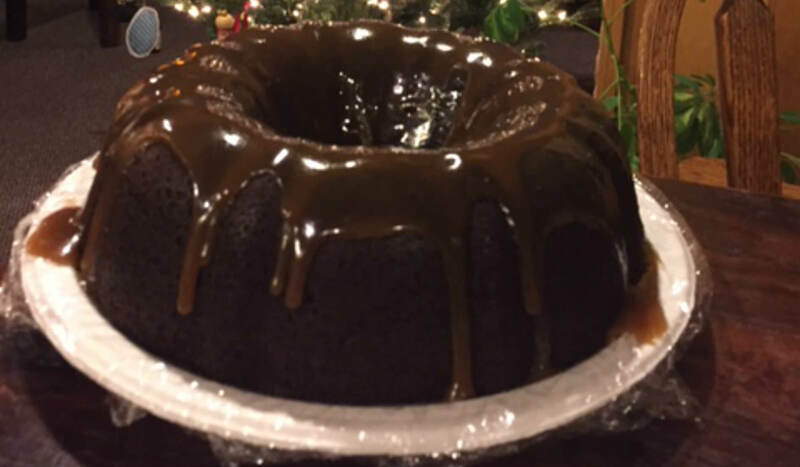 Spray or grease bundt pan - WELL - this cake can stick! 3. In a medium saucepan over medium heat, bring the Guinness and butter to a light boil, add the cocoa powder and whisk until smooth. Remove from heat and set aside. 4. In a large bowl, whisk flour,sugar,baking soda and salt. 5. In another bowl, using an electric mixer, beat together the eggs, sour cream and vanilla. 6. Add the butter/Guinness mixture to the sour cream mixture and beat until just incorporated. 7. Add the flour mixture and beat until just combined. 8. Then using a rubber spatula, lightly fold the batter to make sure there are no pockets of flour. 9. Pour into bundt pan. 10. Bake for 55-60 minutes or until a toothpick comes out with only a few crumbs. 13. Cover in plastic wrap and place in the fridge overnight (the cake seems to taste better the next day). 1. In a medium saucepan, bring the butter, dark brown sugar, heavy cream and salt to a rolling boil, stirring constantly. 3. Remove from heat, stir in vanilla extract. 4. Add about ½ cup of the powdered sugar and whisk until smooth. 5. Continue to whisk in powdered sugar by the tablespoon until you reach your desired consistency. 6. Remove the cake from the fridge, place on a cake plate and pour the salted caramel glaze over the top. 7. Sprinkle the Fleur de Sel over the glaze if you want!